The L-758DR measures light beyond the capabilities of your camera and ensure repeatable accurate and consistent measurements. In addition, the dynamic range of a particular digital camera or film can be stored, recalled and displayed. Using the USB transfer cable (included) and the Sekonic Digital Input and Transfer software (included), a digital camera or film's exposure profile can be uploaded from a computer (Macintosh or Windows) to the L-758DR. When you need to take a light reading - think Sekonic. Important: To comply with local broadcast regulations, Sekonic wireless systems sold in the various markets around the world are designed to operate at different frequencies. When purchasing and/or installing a transmitter module or using the meter with a receiver, be sure that the meter, module and receiver are designed to be used in your location and use the same frequency. When purchasing and/or installing a transmitter module or using the meter with a receiver, be sure that the meter, module and receiver are designed to be used in your location and use the same frequency. The wireless flash triggering system used in Sekonic meters consists of two parts that are designed to be used together and operate only at a specific frequency. Do not install a CE marked module into an FCC marked meter or FCC marked module into a CE marked meter as this will produce a unit that is not compatible with either frequency. Channels: 1 to 16 channels standard, 17 to 32 "Selective Quad Triggering"
Box Dimensions (LxWxH) 10.0 x 6.5 x 3.5"
L-758DR DigitalMaster Flash Meter is rated 4.8 out of 5 by 162. Rated 5 out of 5 by Serottaboy from The Best I use this for portraits and weddings, and landscapes. my third light meter from sekonic and b&h. My first sekonic was the 508 zoom master and it works like new after 18 years. The 758 dr. Rocks because of it's pocketwizard trigger. you can trigger a reading at your subject. You don't need an assistant. I am a 1 man operation and use multiple pocketwizards for stunning light in outdoor weddings and portraits. The sekonic Pwizard trigger is actual more consistent than my Pwizard on top of my camera. Very accurate readings, very easy to use. Waterproof.And b&h h is awesome. I have spent probably $20k at b&h the last 6 years. Rated 1 out of 5 by Barnack from Beware if You Are a Mac User! After spending an hour to calibrate this meter, I discovered, at the very end of the process, that Sekonic's Data Transfer software would not recognize the meter, which was plugged into my Mac Pro running Snow Leopard. This is simply not acceptable for a pro meter. Moreover, Sekonic has no customer service. There is no number to call, and no email address that goes to customer service. Perhaps Sekonic should issue $500 rebates to those who cannot get full use out of their L-758DRs. Further, the expensive target is now useless to me. There is simply no excuse for such shoddy software and lack of customer service. Rated 5 out of 5 by Scotterdoo from Best Ever I am primarily a landscape photographer however I do have a studio and do portrait work as well. The Sekonic L-758DR handles it all! The spot metering (1 degree) is invaluable when trying to pluck out crucial highlights in a landscape scene and the wireless capability to trigger Pocket Wizard receivers in the studio is awesome as well! Check out Joe Brady's webinars on this meter either on Sekonic's website or YouTube, these will get you up and running very quickly and you will have a thorough understanding of how this baby will rock your photography world! Rated 3 out of 5 by Survivor from Great electronics - fragile construction Great meter. Included software is less than you might expect, but you can do firmware upgrades and profile the meter to your camera. There is a big if though. You need to purchase a rather expensive target to shoot images for profiling. $$ extra. Should be included if you buy the meter. At the very least, it should be bundled at a great discount. Very expensive meter for such cheap construction. Body is plastic. Dials are plastic, too. Case barely fits, and is very cheap and not protective. This is a professional meter in hobbiest packaging. Body should be metal - magnesium alloy. Battery door should be more secure. Case should be hard and protective. Sekonic could and should do better. Rated 4 out of 5 by bgregsto from Great meter but support issues The L-758DR is a great meter that functions well in incident and reflective modes. It's very easy to use once you get used to the the interface. It's very consistent and seems to be very accurate. I like having the ISO2 button to give me the exposure compensation settings. My only complaint is that Sekonic doesn't seem to have any interest in updating the data transfer software for OS X 10.11. El Capitan has been out for over 7 months and they have no support for it yet. Their support organization hasn't even responded to my email regarding the issue. If you want to load your camera profile into the meter and are running 10.11 it isn't possible. No connection can be established from the Mac to the meter using sub and 10.11. Rated 5 out of 5 by Tony the Humanitarian from Metering is the way to go I have relied heavily on my camera's metering and had mixed results. Now that i use this meter, I get the look I want every time with great exposure. I purchased this particular unit because it is rugged and I need to travel with it. The only problem I had with it was syncing it with the new PocketWizard FlexTT5, but the issue is really with the PW. I had to connect the PW to the computer using the supplied USB and disable the Use ControlTL on one of the configurations. It was painless, but I just expected to use it all together out of the box. Everything was setup in about 10 minutes and I am really happy with box items. Rated 5 out of 5 by MBNative from Excellent Meter I hesitated buying an incident meter because so many vocal digital photographers said they were obsolete. Theyre wrong. Setting ratios on studio strobes with the integrated pocket wizard module eliminates guesswork, exposures are more accurate and predictable and the workflow is more efficient. The L-758DR is well built, the Tenba case is well padded with a belt loop for easy access and includes a storage area for a backup battery. The meter & exposure profile target are expensive, but you get what you pay for. Using the L-758DR provides me with invaluable feedback in my lighting analysis: ratios, dynamic range, percentage of flash relative to ambient in an exposure, etc. You will learn more about lighting by actively metering the scene and observing meter readings than by passively letting the camera do it. Rated 4 out of 5 by Robin the doc from high quality product, low quality manual I have some experience with meters and this certainly seems top knotch. It's well constructed and has more options than I can imagine using. However, many options are not very easy to figure out and the instructions are very poor. The internet has some videos that are ok, but they don't really match the manuals or downloads from the sekonic site. I figure, I'm going to have to sit and take several hours diddling with it just to get some idea how many features work. I'm going to try to do my camera calibration. It's probably easier than what appears by the instructions, but i'll see. 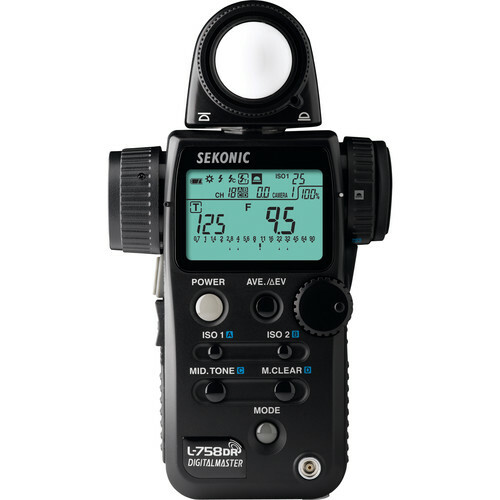 Is Sekonic L-758 DR compatible with Canon Speedlite 600EX-RT ? Is there any way for this light meter to communicate with Paul C. Buff Einsteins? No, I am sorry, the Sekonic L-758DR DigitalMaster Flash Meter is not compatible with Paul C. Buff Einstein flash strobes. I purchased, from B&amp;H, with the Sekonic L-758DR DigitalMaster Flash Meter with Pocket Wizard ?Radio Triggering / Includes RT-32CTL Module.Will this Radio Module work with the Pocket Wizard Flex TTL5 Transceiver and the Mini TTL or is there a different Radio module that is required? If there is what is the ordering information for this radio module?Thanks.Don C.
Yes, the RT-32CTL Module in this meter would be compatible with the Mini and Flex system from Pocket Wizard. Will this Communicate with the Paul Buff CyberSync Receiver Plus? The Sekonic L-758DR is not compatible with the Paul C. Buff CyberSync Receiver Plus. Will this light meter communicate with an Elinchrome BRX 500 monolight purchased in the US from BH Photo? The L-758DR has a PocketWizard trigger built in. If any Plus-Series, MultiMAX, or FlexTT5 is connected to your flash, you can trigger the flash from the meter by simply pressing the measuring button. As it transmits on a different frequency from the Elinchrom flashes, it cannot trigger the built in receivers. Can anyone please let me know a suitable vertical pouch for this meter ? The provided horizontal one occupies too much space in my belt and it is very diffcult to take the meter in and out of the pouch with one hand. Sekonic does not have a vertical case for the L-758 but is considering it. I am sure there are utility cases in the market that will fit it but do not know of any. Wish I could be of more help. I understand this meter can trigger Pocketwizards. But after looking on Sekonic's website and reading the manual, it's not clear if the Pocketwizards output can be changed from the meter like it can with the L-458DR. Can the PW's output be changed from the L758DR? Will this meter do what the PW AC3 zone controller does, essentially replacing it? SorryCan't helpI returned this item. where is this unit made in? At Sekonic's manufacturing plant in the Philippines.